481 pages | 175 B/W Illus. PET and SPECT imaging has improved to such a level that they are opening up exciting new horizons in medical diagnosis and treatment. This book provides a complete introduction to fundamentals and the latest progress in the field, including an overview of new scintillator materials and innovations in photodetector development, as well as the latest system designs and image reconstruction algorithms. 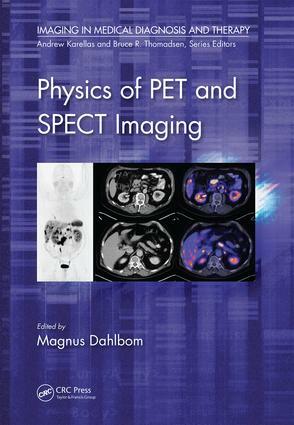 It begins with basics of PET and SPECT physics, followed by technology advances and computing methods, quantitative techniques, multimodality imaging, instrumentation, pre-clinical and clinical imaging applications. "A well-written, comprehensive, advanced-level book that also provides enough information about the physics, mathematics, instrumentation, quantification, and clinical applications of these imaging modalities." Magnus Dahlbom has been working in the field of Nuclear Medicine for close to 30 years. He earned his B.Sc. in physics from the University of Stockholm in 1982. He received his Ph.D. from UCLA in 1987. His Ph.D. research was on high-resolution PET detectors and image processing. In 1989 he was part of the team that started the first clinical PET operation in the U.S. at UCLA. Around the same time developed together with Drs. Edward J. Hoffman and Michael E. Phelps the Whole Body PET imaging technique, which currently makes up more than 90% of all PET studies performed. His research interests are in PET and SPECT instrumentation and image processing. Since 1989 he has been the chief physicist at the Nuclear Medicine services at UCLA where he is responsible for all imaging instrumentation, including SPECT, SPECT/CT and PET/CT systems. At UCLA he is the faculty graduate advisor in the Biomedical Physics graduate program. He is teaching graduate level courses on the basics of Nuclear Medicine imaging and instrumentation. He has authored and co-authored more than 120 research papers and 11 book chapters on nuclear imaging instrumentation and processing. He was also co-editor of a PET/CT atlas. For the last 6 years he has been serving as an editorial consultant to the editor-in-chief of the Journal of Nuclear Medicine.